S4YE has two key priorities: 1) Innovation and 2) Knowledge, Learning, and Communications and three cross-cutting themes: gender, youth participation, and private sector engagement (see framework below). The two priorities contain six primary work streams, detailed below. S4YE is creating a “learning laboratory” with a few select existing youth employment programs implemented by a variety of partners to learn, enhance, and strengthen our collective impact on youth employment. S4YE has begun working with a diverse group of 19 youth employment programs, creating a learning network, and has curated ongoing and live innovations that are being implemented. 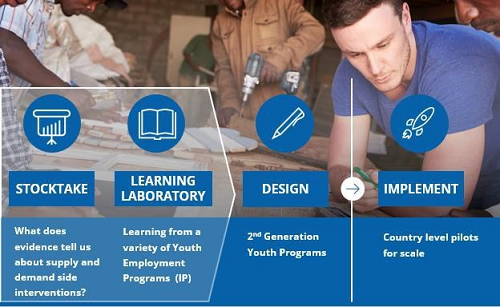 These lessons will also provide an input to the 2nd generation youth employment programs. 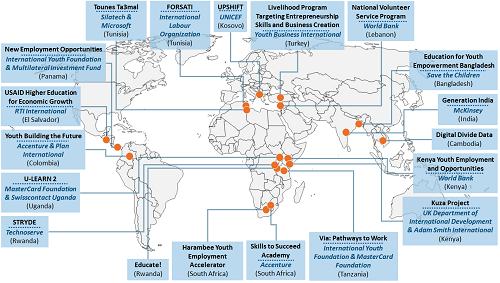 The Impact Portfolio’s collective reach is over 550,000 beneficiaries annually, across all major developing regions. S4YE will design, develop, and test innovative guidelines for 2nd generation of youth employment programs that integrate supply-side interventions with those on the demand side, working with firms to generate more jobs for youth. These guidelines for an integrated approach will inform the design of a few country pilot programs that will be implemented by S4YE and include robust evaluations. The design will involve all three cross-cutting themes and could also focus on more specific areas of interests (e.g. digital jobs). S4YE's annual reports focus on a specific topic of interest to the youth employment community. These reports bring together evidence and knowledge on a specific topic and are usually coauthored with S4YE partners and disseminated broadly as global public goods for use by a wide-variety of policy-oriented organizations, private-sector, academic bodies and youth employment practitioners. S4YE's most recent publications include "Toward Employment Solutions for Youth on the Move" (June 2017) and "Skills Gap or Signaling Gap: Insights from LinkedIn in Emerging Markets of Brazil, India, Indonesia, and South Africa" (June 2017). These brief “how–to” notes are developed by the Secretariat Knowledge Management team and used for strategic partnership development purposes, especially to highlight topics and themes of interest to youth employment practitioners. The briefs will be co-authored with an existing or potential partner. S4YE's most recent publications include "Promoting Coordination to Advance Employment Services for Youth" (July 2017) co-authored with GIZ and "Linkages and Youth Employment: Opportunities in Extractives and Infrastructure" co-authored with IFC (July 2017). S4YE will also contribute to thought leadership on youth employment by organizing workshops, online discussions, webinars, private sector roundtables, in-country consultations, and conferences to engage with a variety of partners, stakeholders through different fora including online discussions. The coalition will participate in youth employment events to share lessons and experiences with other like-minded initiatives and organizations across the globe. S4YE will work with the Global Initiative on Decent Jobs for Youth to develop a joint knowledge platform. Additionally, the coalition will develop pilot evaluations from 2nd Generation Youth Employment Programs to build a robust evidence base for youth employment. These evaluations will be produced as separate knowledge products, in addition, to use in the knowledge platform.